Big Back-to-School Promotion! Starts now ... until October 31, 2018. It's simple...follow MrsQuimbyReads TPT Store . 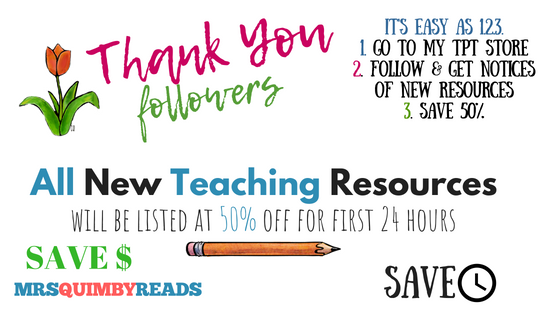 Followers receive notifications when new teaching resources are listed. All new listings will be 50% off for the first 24 hours. You will also know about the FREE resources listed and the many sales throughout the year. 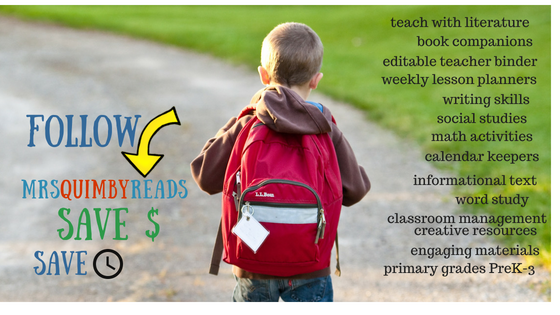 A great way to get teaching resources for less $. Over 20 resources for back-to-school and beginning of the year activities to be listed in July and August ! and more following for September and October ! Read. Think. Write. Listen. Solve. Learn. 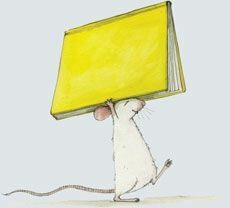 TPT Store MrsQuimbyReads to save $. Follow today!